We are looking for a slogan that best describes CrossFit CrownTown. What better way to establish a slogan than straight from our members? Submit your short & sweet slogan below. Over the next 4 days we will choose a slogan for our shirts & other aspects of the gym. 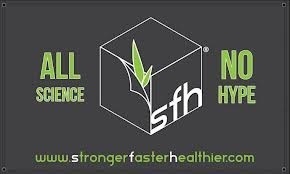 This winning slogan will win a bag of Stronger Faster Healthier Recovery ($69.99 retail value) and a 10 oz. bottle of Stronger Faster Healthier fish oil + D3 ($59.99 retail value)! September 29th: Prospective Regional Athlete meeting. At 6pm Sunday evening we invite any CrownTown member with interest in competing in the 2014 Reebok CrossFit Games Open who would like to be a part of the Regional team. In 2013 we missed qualifying by only 3 spots, which means with a little bit more preparation this year we’ll be ready. The only details you need to know at this moment is if you’re interested then show up to the meeting. Focus on high pull under hip, heel kiss, and landing ball of foot. Each Member will run one leg. Team will rotate through legs until every member has had a chance to run every leg. *One team member works at a time. The losing team(s) will do Tabata plank holds.